Show us Your Stash….. Kat! The stash swapping party seems to have go off to a very good start over the weekend, it’s been great to see some of the lovely things up for grabs on Pinterest and blog posts. A reminder that you can see a lits of all the participants here. If you’d like to join in the swap, just leave a comment below with a link to your blog, and we’ll add you to the list so that other sewists can find you easily. As promised, Kat and I have decided to reveal our stashes to the world. 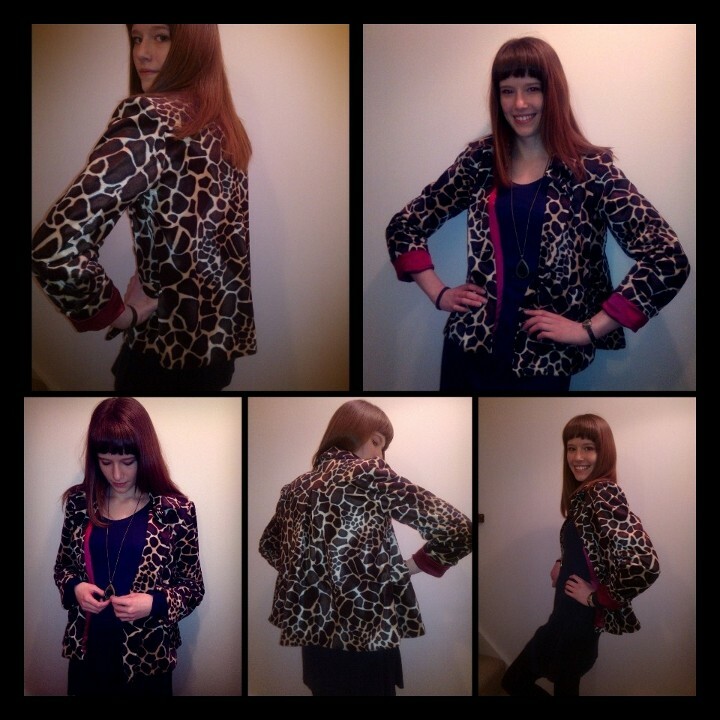 You can see mine on Kat’s blog, but here we are revealing Kat’s collection of fabrics etc. I set her the same questions as I answered, and demanded photographic evidence too! 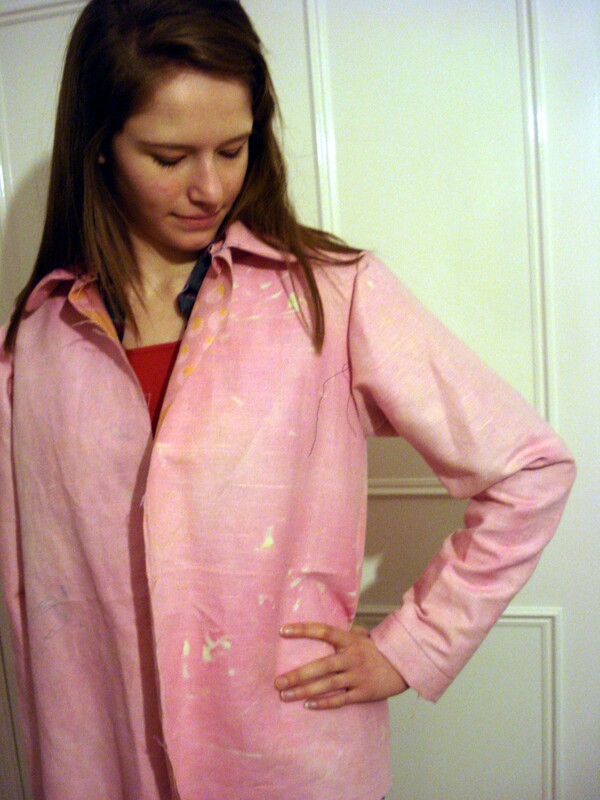 Um, well, I got into sewing again back when I was in the early days of university, so around about 14 years ago now. And I’ve been stashing since then. I come from a long line of stashers – my mother has a nice big stash (part of which has migrated to my stash, haha!) and my grandmother apparently has a stash of sewing and knitting patterns (which I hope to be able to see one day soon, she keeps them hidden away). So you could say I come by my stashing tendancies naturally, and there wasn’t really any way to avoid stashing. I’ve also inherited a few stashes from friend’s mothers when they found out I sew. Yes, my stash is out of control. It’s bigger than I want to contemplate. Here’s some of it…..
About half of it is stored in boxes lined up against the wall of our spare bedroom. The rest is stored in my bedroom (which is quite large, and half of it is my sewing area). 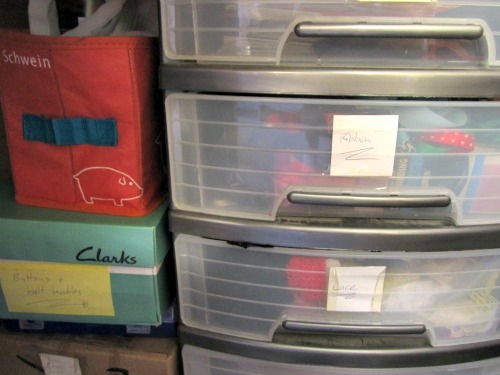 I also have a cupboard full – patterns (grouped by era) on the top shelf, and fabric on the bottom shelf. And three shelves in my wardrobe have ended up being fabric. And one shelf is patterns. And there are a few bolts of fabric in the wardrobe in our spare room. Pattern shelf – or is that shelves? Eek! Good question. I have no idea. The oldest by age would be some I inherited from other people’s stashes. Oldest I bought myself? Probably one of these crazy bright synthetic knit things – I went through a stage in early university years of dressing in crazy bright 1970’s print fabrics and flared jeans. I still have some fabric left over from those days, heck knows what I’ll do with it as it so isn’t my style any more…… (Maybe swap it??) Pretty much as soon as I started sewing I started accumulating fabric faster than I could use it! 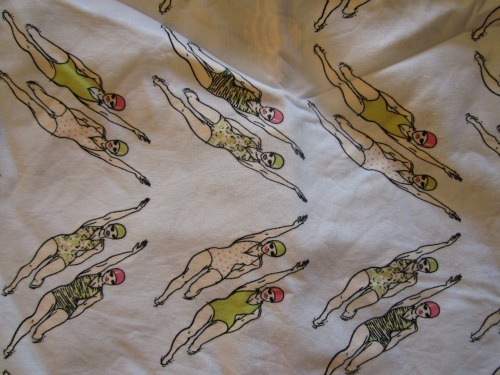 This cotton fabric with retro swimming ladies printed on it. I got it as part of the Sewists Secret Santa swap – whoever sent it to me totally nailed my style! (And I really want to know who it was!!) I’m going to turn it into a 1950’s shirt at some point soon. 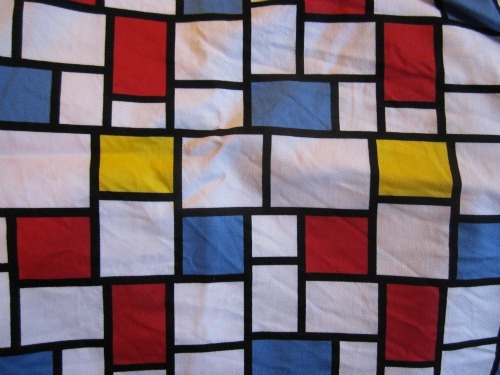 My mother just gave me this Mondrian-style cotton drill. Ain’t it fabulous? It’s going to be a 1950’s full skirted dress, to make the most of that awesome bright print. I’ve had this stitchbird printed quilting cotton for a couple of years now. I absolutely adore it, and I’ve been waiting for the perfect opportunity to turn it into a dress. 1950’s or 1940’s style? One or the other…..
A bit of both. I stash patterns as well, and sometimes I find fabric that I know will be perfect for a pattern I’m wanting to make up. Most of the time, the fabric is what dictates a project for me though – I see something, it calls my name, whispers in my ear that it wants to be a dress or a shirt or a skirt, and next thing I know I’ve bought it home and it’s sitting on my desk while I try and find space for it. Oops! 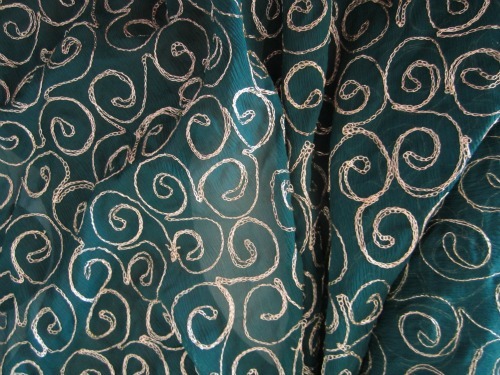 I bought a length of gorgeous lightweight dark green silk, with gold metallic thread spirals on it, a few years ago. (Read: about 9-10 years ago. Oops.) I love it – it was one of those (very very few) times when I bought fabric without knowing what it was going to be turned into. And I’ve never used it. It’s so pretty, it seems it needs to be an evening dress, but I never wear those so see no point in making one. And so, it languishes in my stash. Every so often I bring it out to look at it and admire it, and feel a little bit guilty that I still have no idea what to make out of it…. Oh no, I’m a nice well-rounded individual. My problem includes everything. 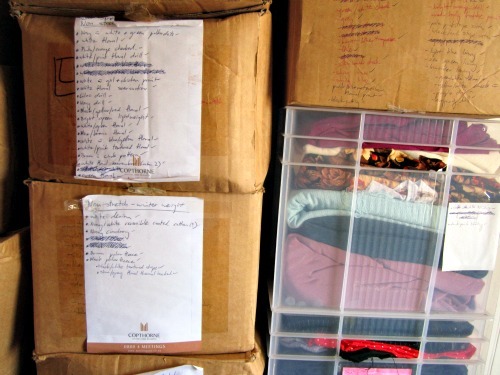 I have boxes and drawers full of patterns and notions. I even have two sewing machines sitting around unused, both vintage ones I’ve picked up somewhere, intending to get them working and try them out. So many plans, so little time….. 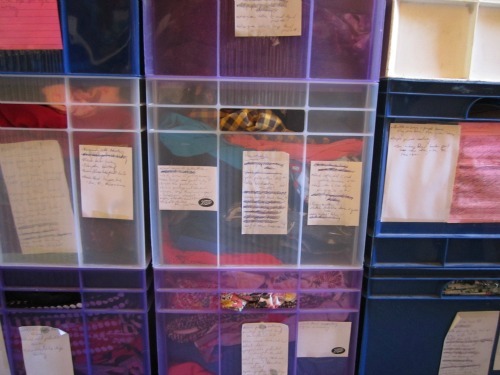 Thanks Kat for letting us have a glimpse into your fabric hoard! 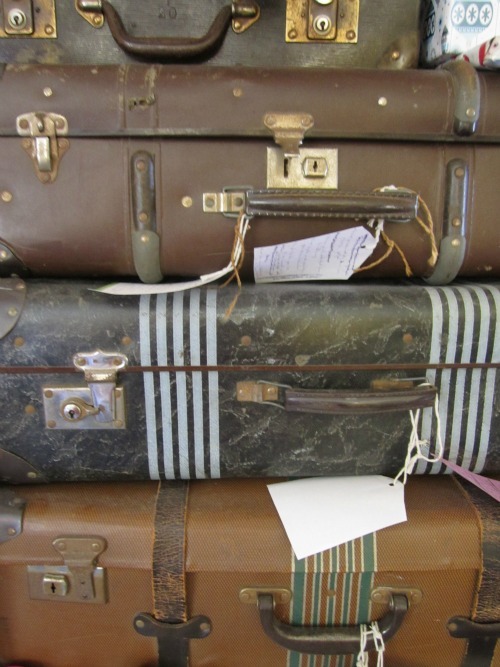 I love your vintage suitcases, and I think I may have to start labelling my boxes, like you do. 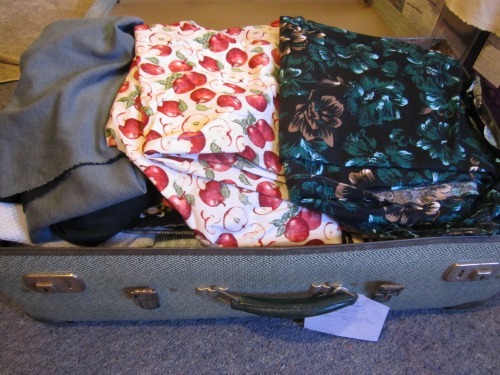 You certainly do have a lot of fabric, good luck with the swapping! Author Anne WPosted on 04/02/2013 Categories Swap your stashTags fabric swap, stash swap, vintage fabric, vintage patterns23 Comments on Show us Your Stash….. Kat! There are also a heap of patterns, please check out the Pinterest board for more. If you fancy a piece, leave me a comment and I will reserve the fabric for you. I will remove the item when we have done a swap. Comments can also be left on the pinterest board. Black jersey with high elastane content. Drapes very well, cool to wear. 1.6m x 150cm wide. Fabrics. Patterns. Buttons. Ribbons. Boxes, drawers, cupboards and bags full of lovely things. That’s what is hiding in my sewing space. Some aren’t doing a terribly good job at being discrete. Just about every year I tell myself I have to make more from what I have before picking up a delectable new something or other. 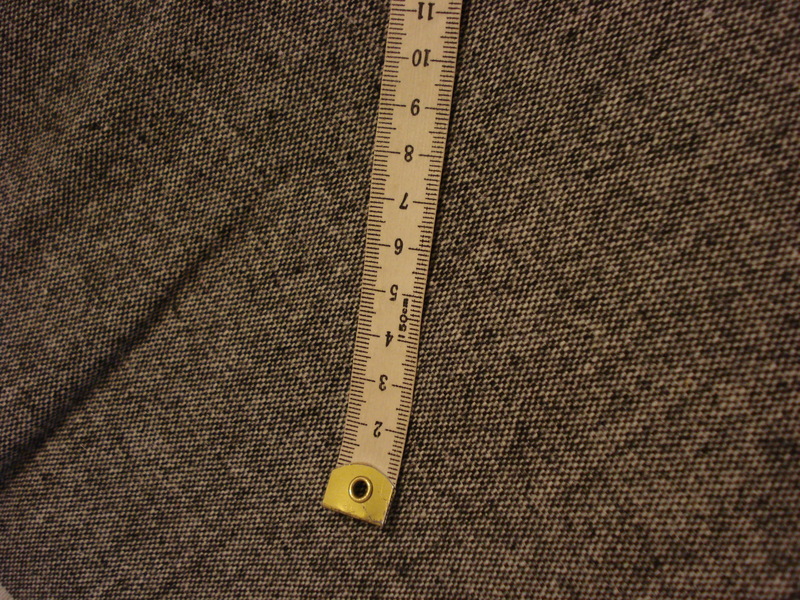 This time I decided I’d have to use two pieces of fabric from the stash before being allowed to purchase anything new. So far, so good, but I have to admit that some of what’s “hiding” just isn’t me anymore. And because I bought it for me, it won’t suit the girls either. What to do? SWAP!! Kat from Modern Vintage Cupcakes and I have been planning a swap. One person’s unsuitable fabrics or patterns could be just up someone else’s street. And there’s no buying involved! A win-win if you ask me! Join us to Swap Your Stash this February – yes, just for February!! We even have a button! Thanks to Kat for this part, I’m hoplessly low tech on that front! We’ll be revealing our own swap items in the next day or so, along with interviews from bloggers about their own stashes, how much they have, how they hide store it and how they add to it. We have set up a Pinterest board for you to browse, and to add your own pictures of swap items. Join us – it’s easy! Read the guidelines, write a blog post showing all the things you want to swap, pin to Pinterest and let us know in comments on one of our blogs (Kat‘s or mine) what the URL of your swap blog post is. We’ll add you to the participant list, so other swappers can find you. Author Anne WPosted on 02/02/2013 Categories Swap your stashTags fabric swap, stash swap7 Comments on Join the Party! Welcome to the Swap Your Stash party! Want to join in? We’d love to have you! Stash Swapping is open to everything stash-related – fabric, patterns, and notions. (Heck, even sewing tools, if you feel that way inclined!) It’s up to you and the person you’re swapping with what you feel is a good swap for what. How do I get added to the participant list? Joining in is easy – just do a blog post (or two, or three…) featuring the things you want to swap, link back to the master list by leaving a comment on it or one of the stash swap pages with the link to your swap blog post (we’ll see your comment and add your post to the list), and start swapping! I see there’s a Pinterest board – what’s that about? There’s a Pinterest board set up as well so that people who are participating can see all that is being swapped in one place. It’s a good idea to add things you’re swapping to the Pinterest board, as it means it’s a lot easier for people to find things they like and want to swap for. Leave a comment below with you Pinterest handle/name and we’ll find you and add you to the group board so you can pin away. Once you’re added, it’s nice and easy to add things to the board – simply pin each of the images from your blog post. What should I include in my blog post? The more details you put about what you’re wanting to swap, the fewer questions you’re likely to have to answer – it makes things easier for both you and your swap partner/s too! 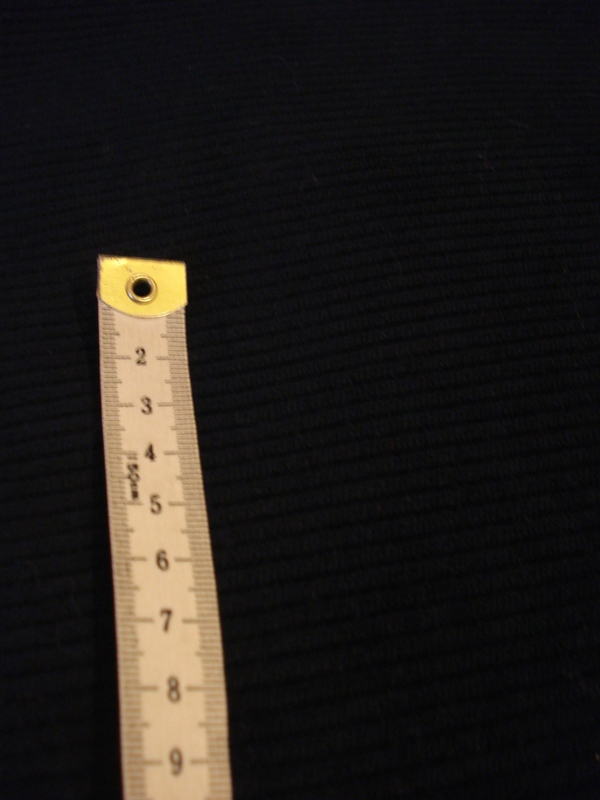 Ideally, photograph fabric with a tape measure included in the picture, so people can get an idea of the size of any texture or print. With everything, the better the pictures and descriptions, the more they’ll appeal to people! It’s up to you whether you’re happy to send internationally or not. (Or maybe you’re happy to post patterns overseas, but not fabric?) Either way, make it clear on your blog post so there’s no confusion. The swapping finishes on 24 February. Aim to have all of your swap items posted off by 3 March. What do I do once something has been swapped? Once you’ve swapped something, make it clear that it’s no longer available. Update your blog post to say it’s been swapped, and (if you put it on) remove it from the Pinterest board. That way, there’ll be no confusion! Have fun!! This is all about making friends, and reinvigorating your stash. Enjoy it! Author Anne WPosted on 02/02/2013 02/02/2013 Categories Swap your stashTags fabric swap, swap your stash1 Comment on Swap Your Stash!! Where does the time go?? January has been a blast, so many new things! Resolutions are still going strong, I wonder how long they will all last! I decided 2013 would be the year of “Do something different“. So what am I doing? 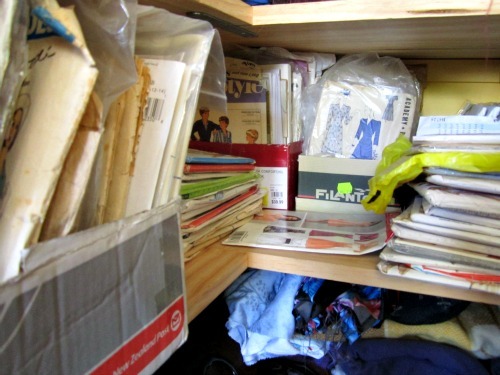 Fabrics & sewing: I have to use up my stash of fabrics and patterns! I have decided that for every 2 pieces of fabric I use from my stash, I am allowed to buy 1 piece of fabric new. IF I need it. Of course, notions, linings and interfacings are completely absolved from this! 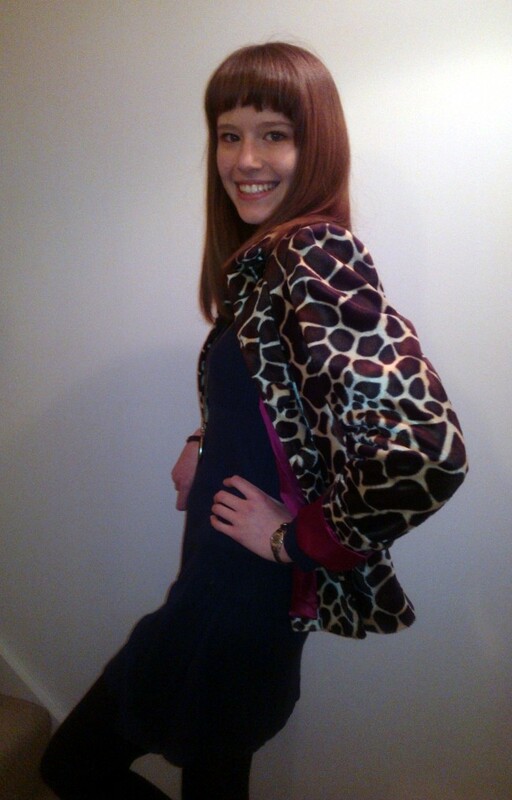 Getting out & about: Chantelle at Fat Mum Slim has a “A Photo A Day” challenge. There are word prompts for each day, and you’re encouraged to interpret these for your photo. I’ve had a great time so far. I do not have a fancy camera, and sometimes have to rely on my phone, but I’ve discovered some really cool apps and editing software online. My new header was made using PicMonkey‘s collage options! Burda challenge. Melissa of Fehr Trade made something from each of her Burdas every month last year. Now sometimes you get your new issue and think, “meh, there’s nothing really in there”. Or there’s too much on & you don’t get round to making anything at all. I have way too many Burda magazines that have folded down corners bookmarking the patterns I wanted to make, but never got round to it. 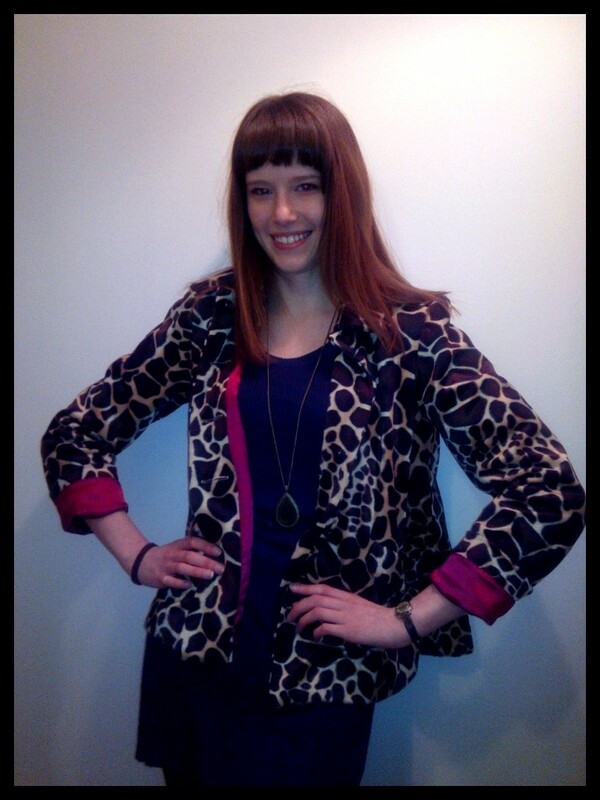 So this year I am going to make at least one pattern from each Burda of 2013. Not necessarily in the month it comes out, but during the year, at least. This one’s got off to a rocky start, because I haven’t even chosen one from January yet! Joining in. Jungle January was just the start! 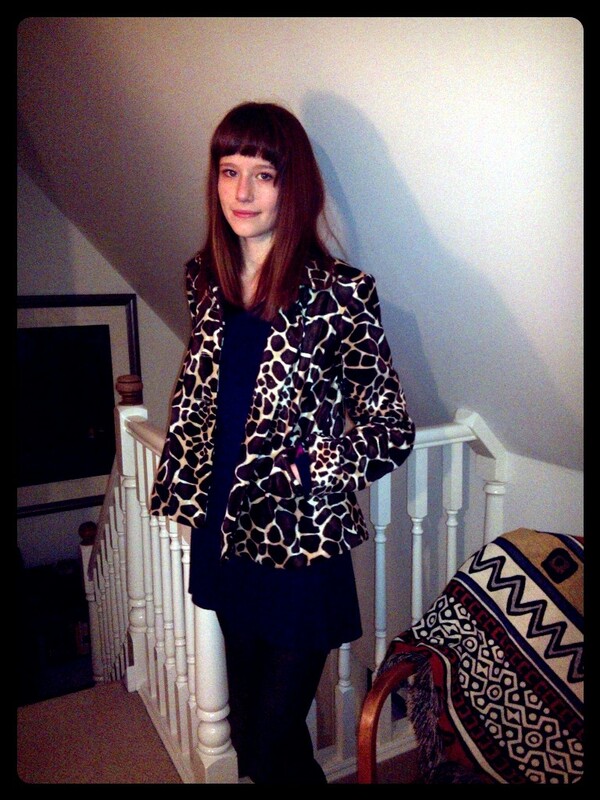 Daughter No2 and I will be partaking in Scruffy Badger’s Polka Dot Fest, but not with a dress. 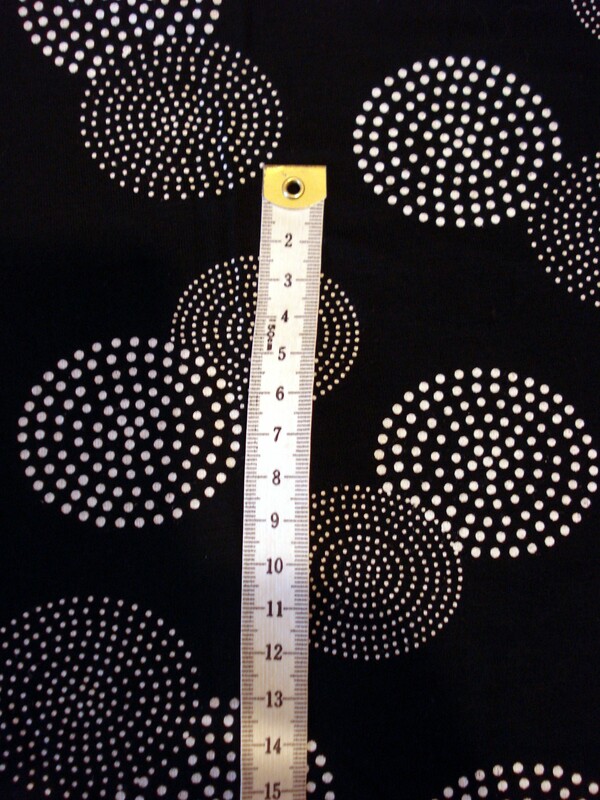 Remember the spotty fabric sample we got from Ditto Fabrics at the beginning of January? She fancies that for some capri trousers, so I have traced out an older Burda pattern for her and we’ll get that done this month. Karen from Did you make that? has the 2013 Sewlutions, and I’m in the jar! I promised to pattern cut some (a) shirt for husband this year. I must do this, I’ve had fabric form him hanging around so ling some of it has migrated to becoming shrits for the girls & myself! Poor bloke! I may even make him a whole suit, but let’s not push my luck too far, ok? Fancy a 1940’s sew-along? Rochelle from Lucky Lucille hinted earlier in January that she may be hosting one in February, I’m looking forward to that! 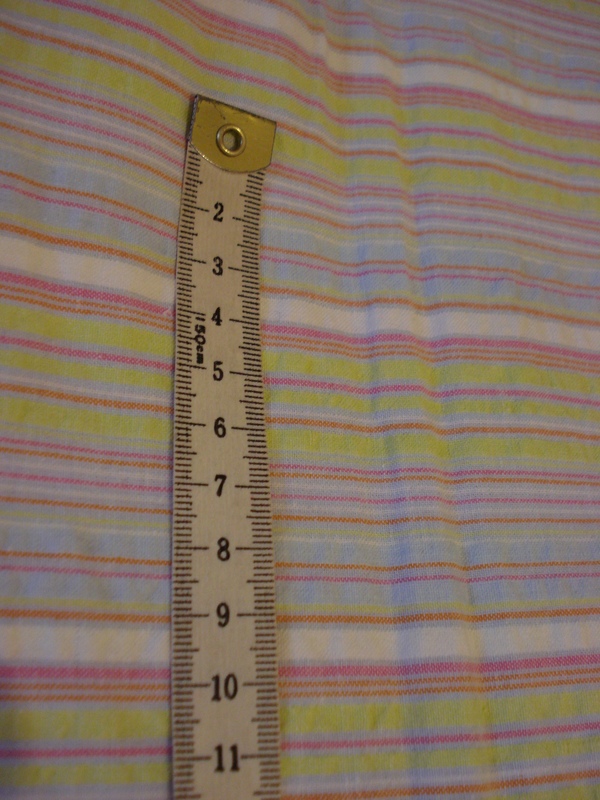 I have the perfect fabric for a little summer dress for Daughter No2. I bought it on impulse 2 years ago from Linda Harper’s in Kenilworth. 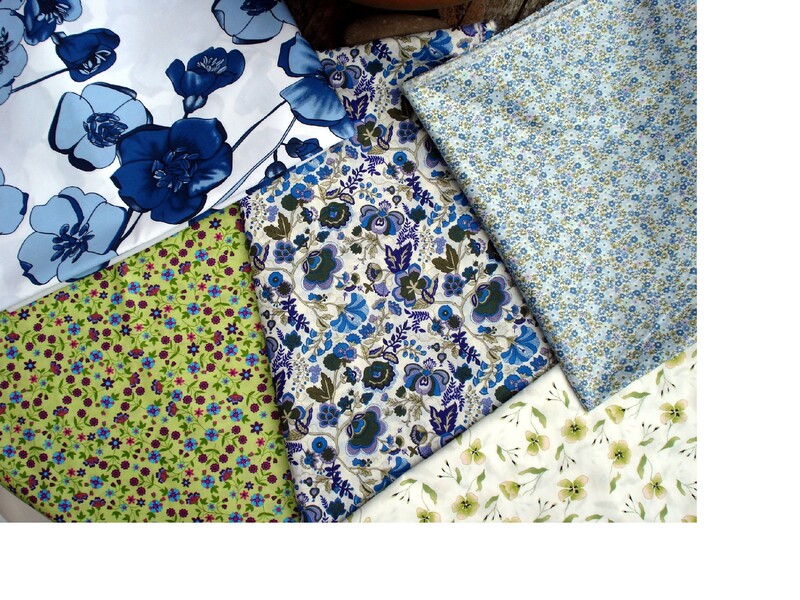 Vintage feel cotton fabrics from Linda Harper. I’m going to use the blue floral print on the right. So far I’ve only managed to use the bright green one and the blue & green next to it! 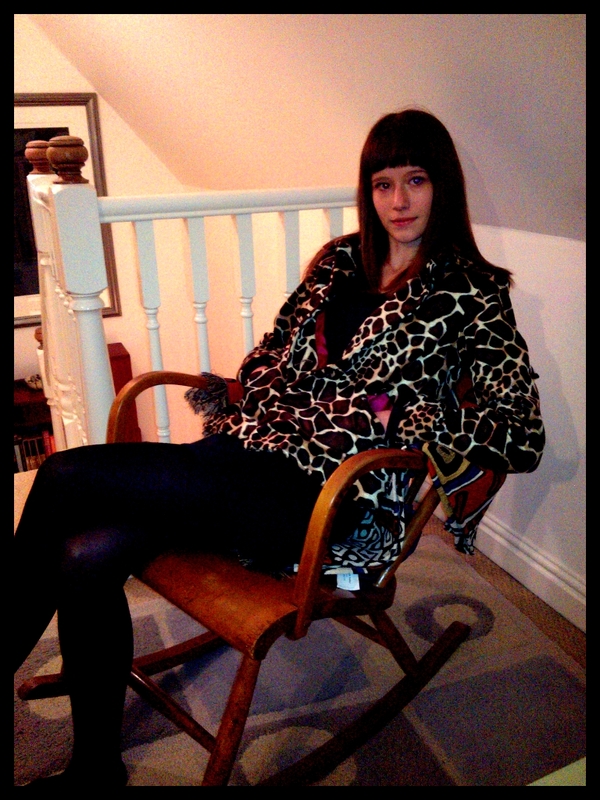 I have managed to make the pattern & toile of a biker-style jacket for Daughter no1, which Daughter No2 is kindly modelling here. 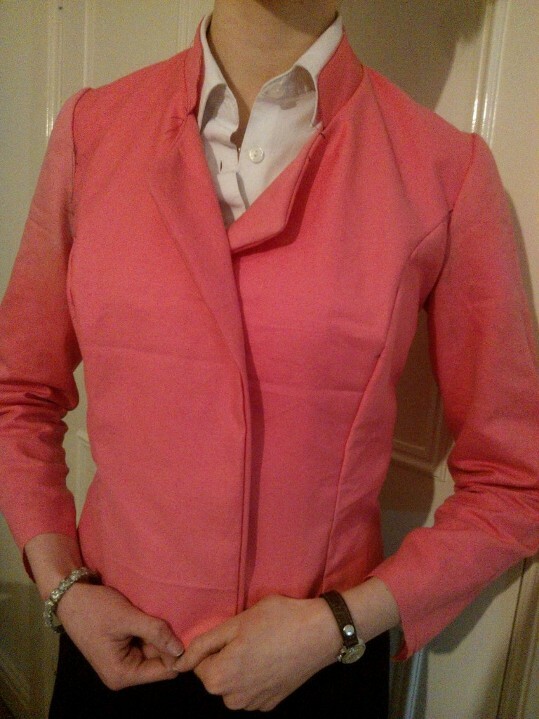 Biker-style jacket toile, & no, I haven’t ironed it yet.. Daughter No1 will be home this weekend, so I will get to make some fitting adjustments and get cracking with the grey herringbone twill. I think it’s going to loook fab! How are your resolutions doing?? Author Anne WPosted on 01/02/2013 Categories joined up sewingTags photo a day, sewing challenge17 Comments on How can it be February already? Author Anne WPosted on 30/01/2013 30/01/2013 Categories UncategorizedTags sew-utions, stash busting17 Comments on Resolutions etc. 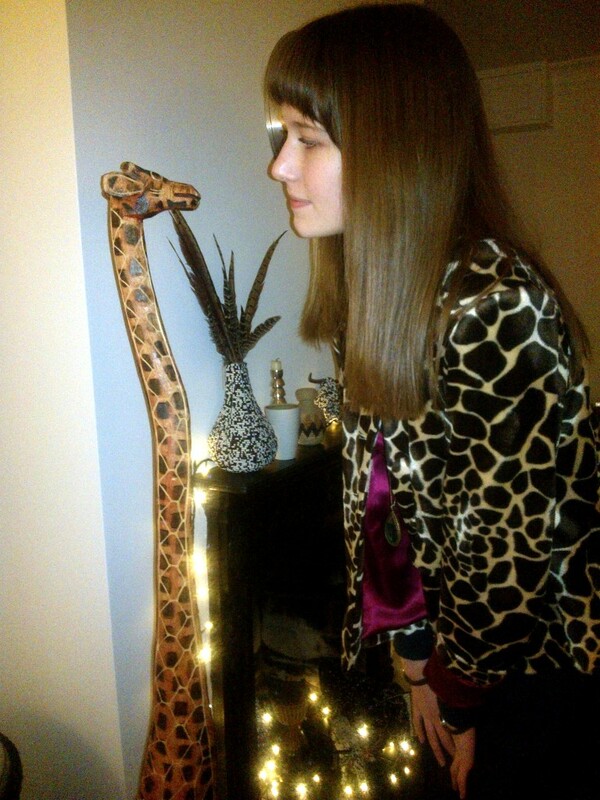 A Giraffe’s Tail – The Long & the Short of it. I need to warn you all, this is a photo heavy post! Phew, I have had such a blast sewing this month! 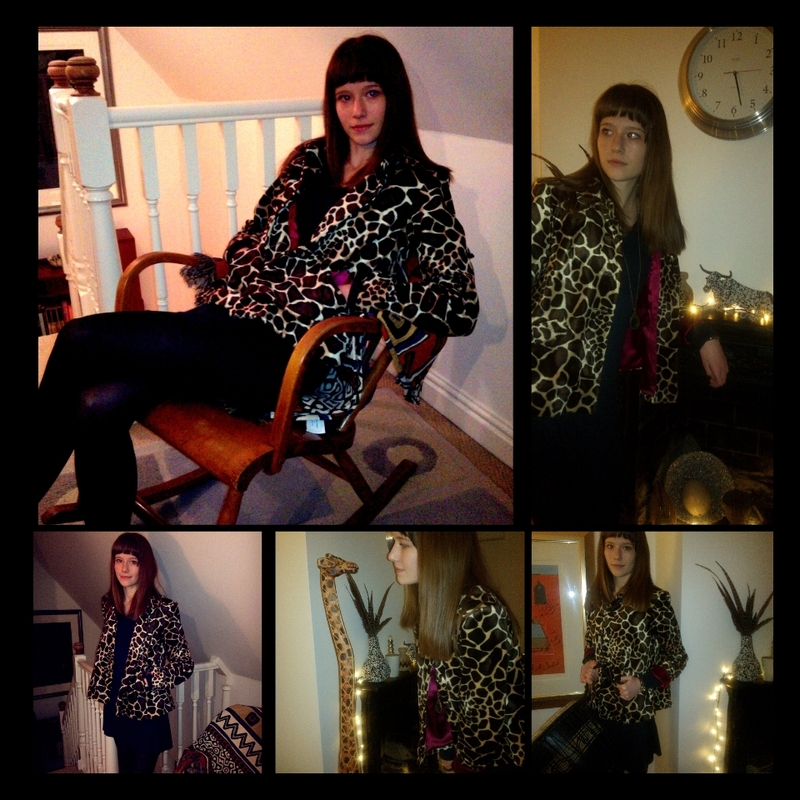 Jungle January has been a real hit, with sewing bloggers all around the world taking part. Thank you Anne @ Pretty Grievances, this was a fantastic idea! So, I used this block because I figured there was no point in going for a tailored jacket block and all it’s shaping etc. 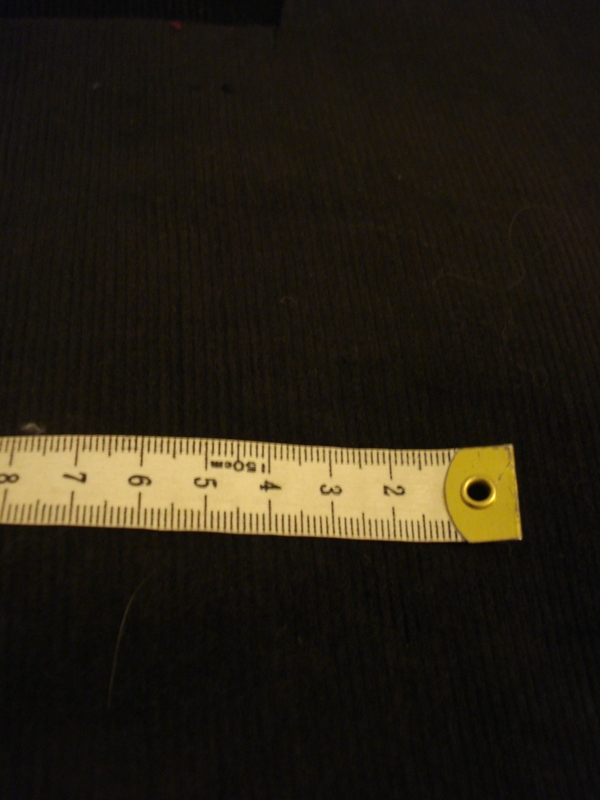 The flat overgarment block is for fleeces. Baggy, shapeless, ugly clothes. I know that now… The sleeve on the right in the photo above is the original. I took out the left sleeve and reduced the ease in the head to try to get it to look better. I also narrowed the sleeve, considerably. It didn’t work. The back is too baggy, the armhole massive, and we hated it on sight. So it went into the fabric recycling bin and I started with the tailored jacket block instead! The relief was palpable! 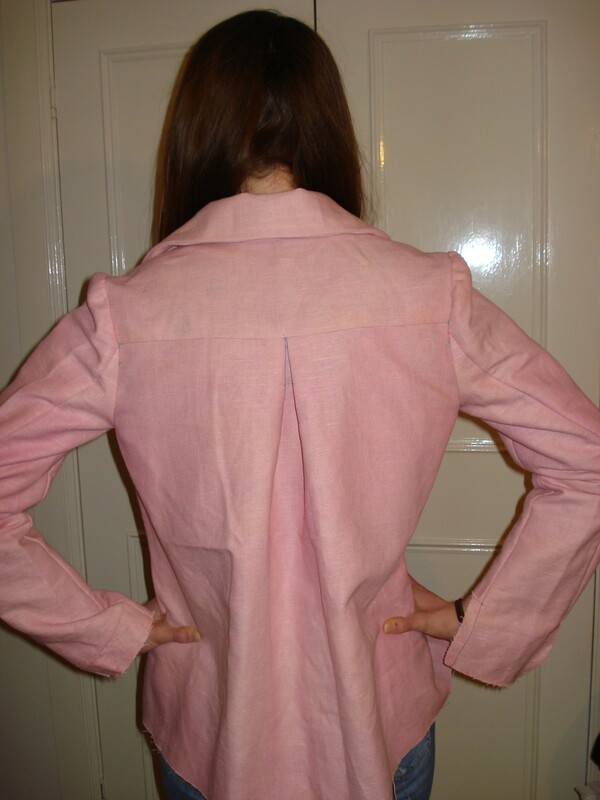 Daughter no2 was happy with this one, the length, the width at the hem, and particularly, the sleeves! Then I ran into the next hiccough. 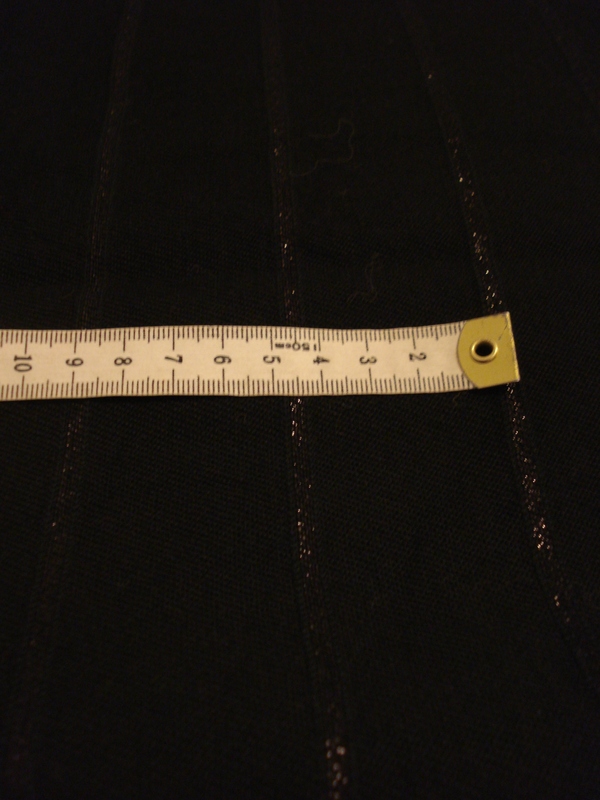 I didn’t want to order the fabric until I had done the toiles and worked out how much I’d need. Unfortunately for me, Ditto only had about 1m of the giraffe print left! Nooooo! 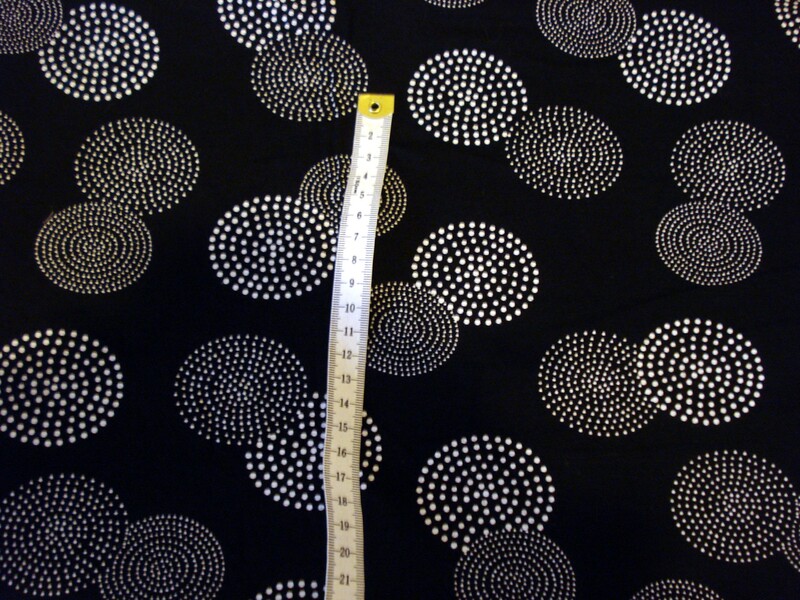 We did get the dot fabric though… That’s another project, and one that daughter no2 is going to tackle herself. After a quick hunt on tinternet I found the same print at ukfabricsonline, and for £1/m less than Ditto, and cheaper post too. 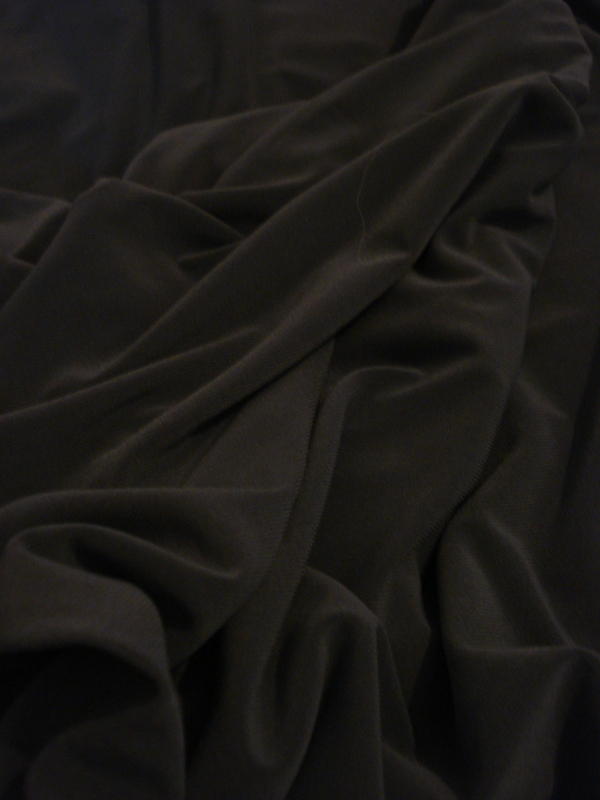 I ordered my 2m and set out to find a suitable lining and contrast fabric. Lining was pretty easy actually. I got a superb satin finish lining in raspberry from Fred Winter in Stratford on Avon, but had no luck with a contrast to do the binding on all the edges and to cover the buttons. Running out of time, we decided to forgo the contrast this time. Oh yes, I’m making this again! 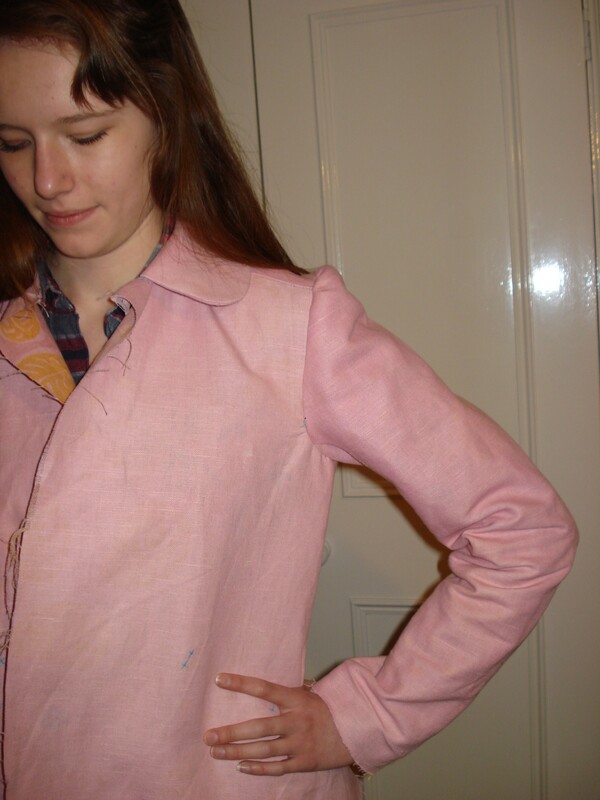 I love the contrast of the lining when the sleeves are turned back! I should say that these photos are all taken on my phone camera. Husband is working on a new project at work, so has nicked my camera for “research” purposes. 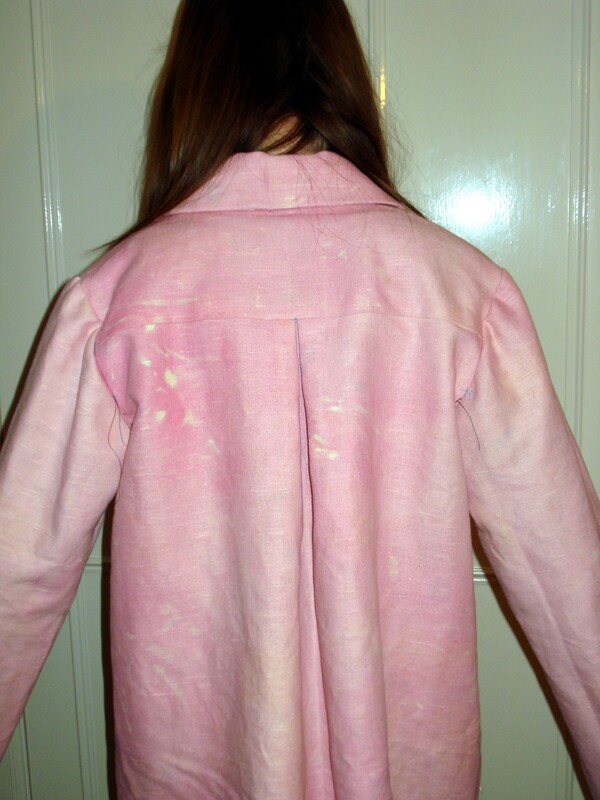 Can you tell how much daughter no2 likes her new jacket? Not too keen on me calling the shots with all the photos though! If there was ever a reason for doing another it is this: Parent’s evening at her school was last night. Her art teacher took one look and wanted to know where she’d got it, wanted to pat it, and warned that if it ever came into the art studio, she wasn’t to be suprised if she couldn’t find it at the end of the lesson. Once again, thank you soooooooooooo much, Anne, for starting us all on this Jungle madness. It’s been fabulous to read the round-ups of all the projects, and I have found some new blogs to follow too! Now, what’s on the cards for February?? Author Anne WPosted on 25/01/2013 11/01/2014 Categories joined up sewing, Jungle January, pattern cuttingTags jacket block, jungle january, sewalong31 Comments on A Giraffe’s Tail – The Long & the Short of it.